← Is climate change beneficial for North Africa? Is it possible to predict inter-annual changes in terrestrial water storage at regional scales? Our results say yes! It is possible to predict changes in terrestrial water storage, when the signal that drives the changes is strong enough. Here is an explanation. The hydrological cycle is a fundamental link between components of the Earth System: atmosphere, hydrosphere and biosphere. It is mainly driven by solar energy, is strongly influenced by the ocean, and involves complex interactive processes that drive the movement of water at various time and spatial scales. This complexity, together with a lack of homogeneous and accurate global observational datasets, compounds the difficulty climate modellers encounter in simulating the hydrological cycle with global climate models (GCM). This leads to large uncertainties in predictions of changes in the hydrological cycle. Better prediction of the hydrological cycle variability and change, with particular relevance to water availability and security, is one of the main priorities of the Global Energy and Water Exchanges (GEWEX) for the next five to ten years (Trenberth and Asrar, 2014). GEWEX emphasises the importance of better exploiting available observations to confront models in new ways and improve our understanding of the processes associated with the hydrological cycle. In line with this challenge, NASA Jet Propulsion Laboratory (JPL) launched in 2002 the Gravity Recovery and Climate Experiment (GRACE) satellite mission, which has been measuring for the first time Earth’s gravity field variations and revealing key insights into Earth’s water storage and transport processes over land, ice and oceans. How does GRACE work? It consists of two satellites, and measures gravity by relating it to the distance between the two satellites. When there is an increase in gravity ahead of the pair, the front satellite speeds up and the distance between the pair increases. Once the front satellite has passed the area of increased gravity, it slows down while the back satellite speeds up, so that the distance between the pair decreases. Once the back satellite has passed the area of increased gravity, the distance between the pair increases and goes back to its original value. 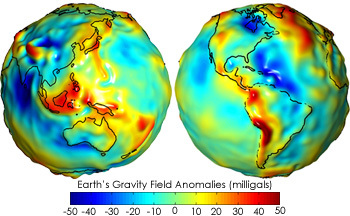 This technique permits to build monthly maps of the Earth’s average gravity field at a spatial resolution of about 300 km, like the one shown on Figure 1. Figure 1. Earth’s gravity field anomalies (milligals) observed by GRACE. From http://earthobservatory.nasa.gov. The variations in the Earth’s gravity field are tiny (less than 1%) but important and reveal changes in the Earth’s density from place to place and over time due to topography (e.g. mountains, valleys, deep ocean trenches), which we can easily locate on Fig. 1. Other variations, not as easily noticed, can also be observed due to changes in terrestrial water storage (TWS), ice sheets and sea level in a timescale from seasonal to decadal. Due to its unique characteristic of being only based on mass, GRACE is a truly independent observational product. It is not connected to any techniques most other observational products use and that are also used to build GCMs (e.g. radiation, temperature). 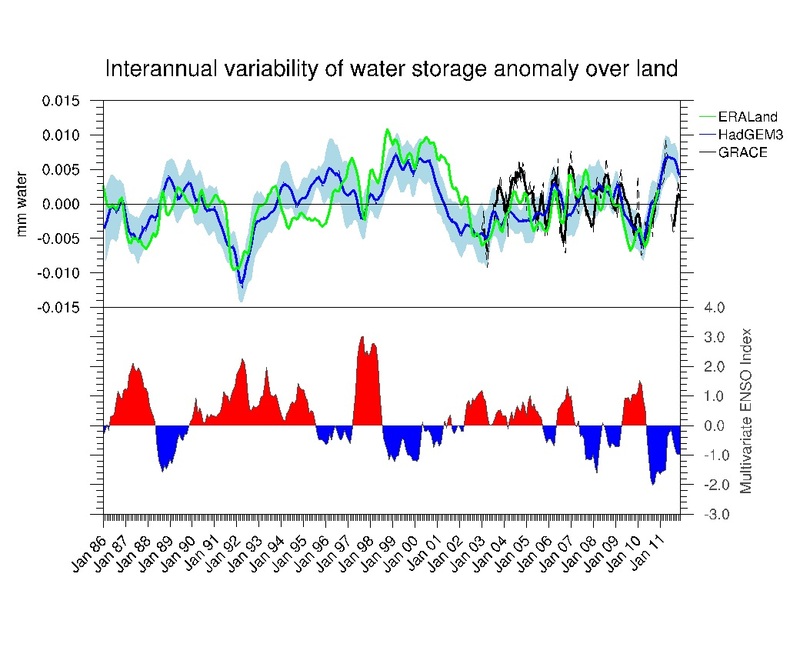 Its decade-long record from 2003 has revealed how inter-annual variations in terrestrial water storage are tied with the El Niño Southern Oscillation (ENSO) through transport of water vapour in the atmosphere from the oceans to the land (Boening et al, 2012). In this study, we compare the GRACE data with GCM simulations with the aim to evaluate GCMs’ ability to import water over land on seasonal to decadal timescales, better understand the large-scale drivers of terrestrial water storage variability, and improve GCMs’ mid- to long-term prediction of floods and droughts, which threaten lives because of climate variability. Such an exercise has never been done before. By analysing our 27 year ensemble simulations composed of 13 members (using the Met Office HadGEM3-GA3.0 atmospheric GCM), we were able to reproduce the variability in terrestrial water storage observed by GRACE caused by the fast and strong transition from El Niño to La Niña that occurred in 2010-11 (Figure 2). Figure 2. Interannual variability in TWS anomaly over global land in GRACE (black), the model (blue), and the ERALand reanalyses (green). The thin black line shows the monthly mean data, the thick lines show a 3-month running average. The blue shading shows the model ensemble spread. Bottom: multivariate ENSO index. Blue (red) shading indicates La Niña (El Niño) events. This 2010-11 transition is characterised by a very strong signal in sea surface temperature patterns to which the model responds very strongly. It simulates a large increase in TWS in Eastern Australia, South Africa, Brazil, Northwest United States, and a large decrease in Central Africa, Argentina, Southeast United States, in agreement with GRACE (Figure 3). Figure 3. Composite map of TWS anomaly (in mm of water) during the 2010-11 transition event (MAM 2011 versus DJF 2010) in the model ensemble mean (left) and GRACE (right). This indicates the ability of the model to simulate the large-scale processes involved in the atmospheric transport of water from the ocean to the land. In these regions, all the model ensemble members agree on the changes in TWS associated with this ENSO event, showing the skills of the model’s predictability in regions that are largely impacted by ENSO. Assuming that the models were able to predict ENSO, this study shows that changes in terrestrial water storage could be predicted on a seasonal time scale for the regions that are largely impacted by ENSO (as also suggested by Figure 2, when comparing with the ERALand reanalyses). Such information would improve seasonal to decadal predictions of terrestrial water storage variability, which govern the long-term frequency of floods and droughts over the globe, and would be particularly beneficial in regions where humans are very vulnerable. During weak-ENSO years and in regions not associated with ENSO, the agreement between the model and GRACE is less evident, and suggests the importance of other processes badly simulated or non-existent in GCMs (e.g. groundwater, irrigation), which need to be investigated. This promises new results that will be extremely useful for understanding the limits of middle-range weather to long-term climate predictions. A PhD study following this work is currently being advertised. Trenberth, K. E., G. R. Asrar, 2014. Challenges and Opportunities in Water Cycle Research. WCRP Contributions, Surveys in Geophysics, 35, 3, 515. This entry was posted in Climate, Climate change, earth observation, Hydrology, Numerical modelling, Remote sensing and tagged GRACE, hydrological cycle. Bookmark the permalink.